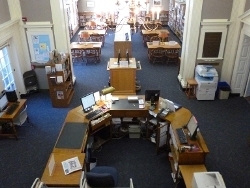 The mission of the Wyomissing Public Library is to provide a variety of popular and informational materials for reading, listening and viewing to the residents of the Borough of Wyomissing. As an extension of this, the library will make its community room available to the citizenry of Wyomissing for lectures, exhibits, seminars, and educational programs. All requests for the use of the library community room shall be made to the Library Director on the form provided. [A PDF copy of the form is available here.] Library functions will have priority when dates are assigned. Use of the room is restricted to activities that will not interfere with library routine or patron services. The party reserving the community room must be a Wyomissing resident and/or a library association member who will be responsible for any damage incurred. A donation for use of the room is strongly encouraged. A fee schedule is attached. This donation must be submitted with this reservation form to insure your scheduled time. In some instances a refundable deposit of $50.00 made payable to Wyomissing Public Library will be required. Every group will be responsible for set up and clean up. In the event the community room is not returned to its original condition, or if there is damage to the room, its contents or equipment, the deposit will be applied toward the correction of damages. If the deposit is not sufficient to cover the damage, then payment for additional damage is expected. Leaders of any groups using the community room are responsible for maintaining responsible discipline of the participants, including the supervision of children, avoiding unnecessary noise, rowdy behavior, and inappropriate language. The use of tobacco and alcohol is prohibited. The Library Director has the right to limit the use of the community room to meetings exhibits, seminars or lectures. The fact that an activity takes place in the community room does not constitute library endorsement of the activity. The Library Director and/or Board of Directors have the right to refuse use of the room to any group or individual whose purpose is deemed inappropriate. The Wyomissing Library Board of directors reserves the right to make additional rules and regulations that may be in the interest of the Board or the public. Use of the room should coincide with normal library operating hours unless previous arrangements have been made with the Library Director. If the event is to be held at other than normal library operating times, the responsible party must insure that all lights are turned off, including bathrooms, and all doors to the facility are secured. No posters, tape, charts, notes, etc. shall be places on the walls or doors of the community room. Some A-V equipment may be provided if prior arrangements are made with the Library Director. Everything must be returned to its proper place and in a clean and orderly condition. Groups must supply their own utensils, cups, etc. Coffee urns of various sizes are supplied. The Library Director, Staff, and Board of Directors are not responsible for any items left in the Community Room. Policy reviewed & approved by the Board of Directors on October 21, 2014.